Eco House project won the 2008 EcoHouse of the Future Competition. The brief asked for an affordable and sustainable solution to housing. The primary inspiration for the design was the concept of a temporal shelter, strongly informed by an indigenous response to the land and climate. 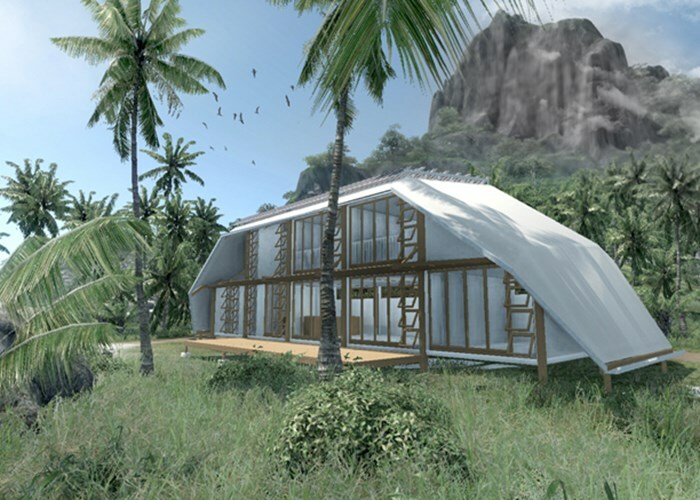 This contemporary tent, that touches the ground lightly and respects the land, is a smart response providing a suitable and sustainable building form for suburban development, offering an alternative to resource-hungry low-cost project homes. The house is a collection of pre-fabricated building elements: the primary structure are six laminated timber portals covered by a high-tech suspended fabric canopy. In each portal bay pre-fabricated units are suspended and configured to produce a flexible interior living environment: the base units can be rearranged to accommodate a variety of requirements from sole occupancy studio to family home. The building is designed to allow for deconstruction, relocation and re-assembly.